Rinpoche or Rimpoche (pronounced: rin-PO-shay) is a Tibetan Buddhist religious/theological honorific title. «Rinpoche» literally means «the precious one in human kind». Presently the title is used to describe any esteemed lama or tulku who head a Buddhist temple. In Tibet and Bhutan, when used alone it refers to Padmasambhava, also called Guru Rinpoche, who first brought Tibetan Buddhism to the Himalayas. (Tib. = «Precious»). Honorific applied to reincarnate lamas and other highly respected persons . (Tibetan rin-po-che) — literally, precious. A term of respect added to a lama’s name . The title for an incarnate lama, meaning «Precious One» in Tibetan . ‘precious one’ — a term of endearment used respectfully for Teachers and Gurus. It does not have a technical meaning or imply a ranking or level of hierarchy amongst lineage teachers . Literally ‘precious one’. Rinpoche is used as a respectful form of address to ones teacher. 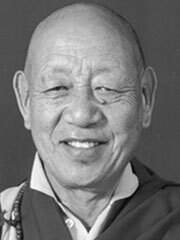 It is a mistaken assumption that the term Rinpoche indicates an incarnate Lama; although all incarnate Lamas are called Rinpoche by their students . «Supremely precious,» a title of respect normally reserved for highly revered incarnate masters . By historic measures the title «Rinpoche» may be considered over-used and indicates little other than a title of respect, especially in cases where the title is self-applied.